Today we drove the 225 miles south from Stowe to our last stop at Lee in Massachusetts. On the outskirts of Stowe, we came across a farm with a impressive display of pumpkins and some llamas in a neighbouring field. We then drove onto Quechee Gorge where we had lunch and met up with an old work colleague of Carol’s who now lives in New England. Finally we drove onto Lee, arriving at our accommodation at the Devonfield Inn after dark. The Devonfield Inn is a lovely New England house dating from the late 18th century which was once the summer residence of George Westinghouse. Westinghouse established the Westinghouse Electric Company, introduced the world’s first AC electrical distribution network in nearby Great Barrington and was the main competitor to Thomas Edison during the so-called current wars of the 1880’s and 90’s. After visiting the centre of Lee for some pictures of the church, we spent the morning at the Berkshire Botanical Gardens. The gardens have numerous different planted areas, but we especially liked the large number of wooden buildings which make excellent photographic subjects. In the afternoon we visited Stockbridge and took a short woodland walk to reach a viewing platform which gave views over the Berkshires area of Massachusetts, north to Mt Greylock. We then visited Laurel Lake close to Lee, before returning to the Devonfield Inn for some pictures in the gardens. Today we drove 25 miles south-west of Lee to visit Bash Bish Falls. These are located close to the New York state boundary, and part of the drive took us into that state. 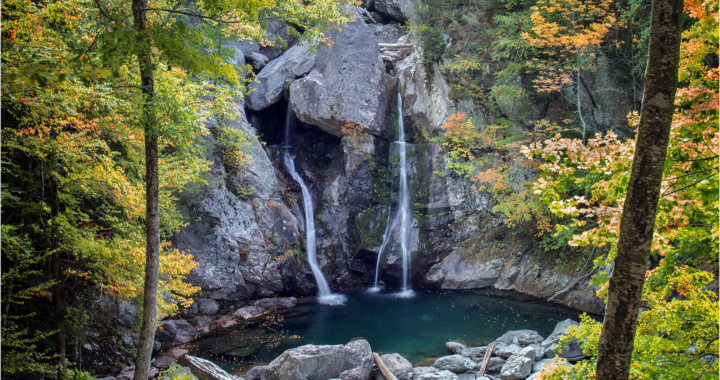 The falls are reached by a 0.75 mile walk up river to reach a rock pool where the Bash Bish brook drops 80ft in a pair of slender falls. In the spring melt, this would be a spectacular location and due to the steep rock walls the area has been listed as one of the most dangerous tourist attractions in America, though it is quite safe keeping to the path. After leaving Bash Bish Falls, we returned to Lee by driving through the Mt Washington State Forest (a different Mt Washington to the one in New Hampshire). Unfortunately we became slightly lost, but chanced upon some attractive New England fall colour at the Mt Washington Union Church. In the afternoon, we drove north of Lee to visit Hill Top Orchard near Richmond This is also the location of Furnace Brook Winery, where we bought a very nice bottle of wine for our evening meal. The following morning, we took some final pictures in the gardens of the Devonfield Inn before driving the 130 miles back to Boston Logan airport for the flight home to Manchester.